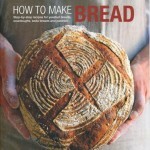 The best books on how to make bread will certainly get you started on your bread making journey. Good equipment is essential, and videos and recipes will extend your range and encourage you to try out new techniques. Bread making classes, led by thoughtful and knowledgeable tutors such as the Bread Angels are also invaluable. Here are our favourite bread books to get you going. While you wait for them to arrive, you may want to have a look at the bread making videos and come along and take a bread course. We look forward to meeting you! every day bread, occasional bread, celebration bread, and sweet bread. A book for every moment in your life. The Italian Baker by American author Carol Field is fantastic. 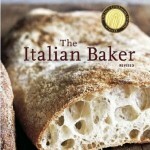 It is the most comprehensive book on Italian baking written in any language. There are sections devoted to traditional bread, contemporary bread, and cakes and cookies, including classics like breadsticks, and ciabatta and also fantastic recipe for panettone. In addition, there are helpful up-front sections that explain history, technique and equipment and each recipe gives instructions for kneading by hand, mixer, and processor and the descriptions of how to shape the bread are clear and precise. The book has just been re-published which is a blessing because a year ago it cost over $100.00 and now it is back down to normal pricing! 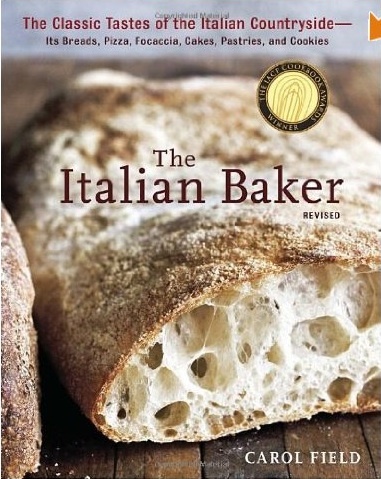 This is a must have for anyone wanting to explore the richness of Italian bread. 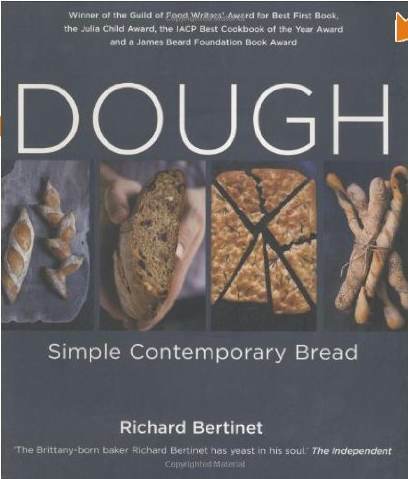 Dough, by French author Richard Bertinet, is an absolutely wonderful book that focuses on a wide range of classical and modern French bread. Bertinet started life in Northern France and has been baking professionally since he was in his teens. 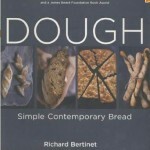 He has a unique kneading technique and the book is accompanied by a CD which shows the technique as well as how to do the basic shapes that are required to bake the bread in the recipes. From baguettes and fougasse to groovy hollow bread soup bowls and "bread shots" this is a lovely book that gives you a thorough grounding in French bread. are lots of lovely recipes in the book and plenty of beautiful and impressive loaves which you would be proud to have on the table. There is a section on flat bread and another on gluten free baking with a few really excellent recipes that turn out great tasting loaves - far superior to any gluten free bread you can buy in the supermarket. 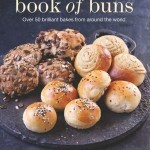 The Book of Buns, the second book by Jane Mason, published in the autumn of 2013. It's a goodie! 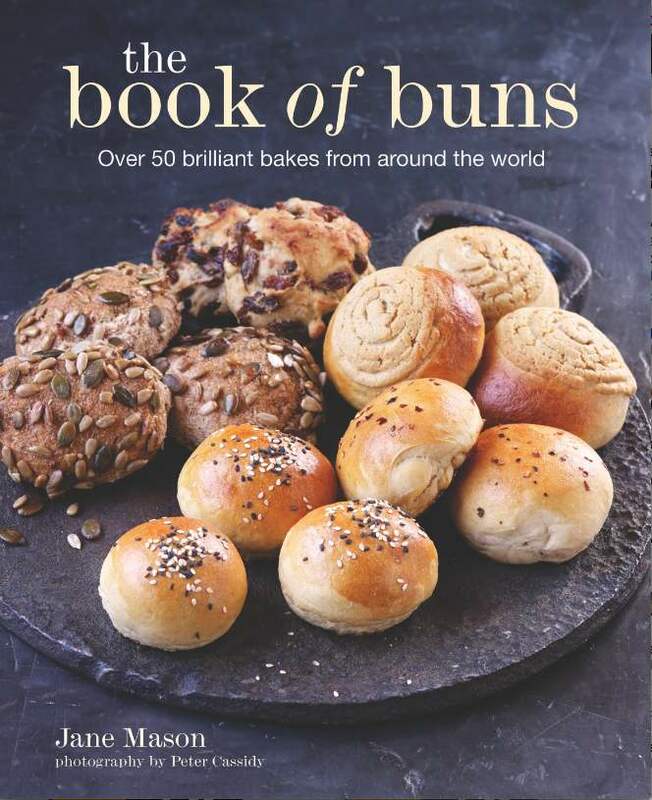 With around 60 recipes for buns from around the world, the book is divided into Everyday Buns and Occasional Buns and includes classics such as Bagels, Chelseas and Hot Crossers as well as lesser known buns such as Pan Chancay from Peru and Lovers' Windows from Iraq. With plenty of step by step photography, the buns are simple to make and delicious to eat. Buns. The new cupcake. I've attempted to make my first sourdough bread ever and yet it didn't work. My starter was great, my dough was great I believe but it turned out to be a very dense and a too hard none edible texture when I took it out of the oven. I wonder if the 85% organic stoneground wheatmeal flour I was using was not suitable or what have I done wrong? I am really looking for receiving your answer as I would love to get to the bottom of the cause..
1. did you knead the dough for 10-15 minutes? You can try searching on the site for sourdough and you will find a couple of helpful articles we have written that also may help. Let me know how it goes! I still have a slight issue with the temperature I bake as that bit keeps going a bit wrong but hope to get there one day!. I am very happy to find your website. I have been making bread in Cordoba, Spain for several months and I have found your videos very interesting. They are permitted me to improve my skills. I have make the "Palets Bretons" they are very tasty and at the same time, now, the bread is in the oven. It seems beautiful and I do not route it will be very good. that is marvellous! thank you for your kind comment. Hello, I was following the instructions for a white wheat starter, before I added the flour and water on the fourth day it was bubbling away nicely, and then nothing. I used the same flour, and water from the same tap, but all activity has stopped. Should I throw it away and start again. no don't stop. it has just run out of food and gone to sleep waiting for next feed! follow faithfully and then put to sleep in fridge - truly, truly, it's fine! I' attempted the scalded flour bread from All You Knead is Bread for the second time yesterday. The first attempt was quite unsuccessful, despite lengthening the baking time by 15 minutes the bread was doughy and under baked . I think I am partly to blame for this as I felt the dough was a bit too dry and possibly added too much additional water. So on my second attempt I didn't add any additional water, extended the baking time by 25 minutes and baked on a higher temperature. The resulting bread is less doughy and is a better bake but quite tacky and sticky to touch. I this how it's supposed to be? Should also mention I shaped the dough into rounds and proofed in baskets as I was afraid if I used the shaping technique described in the recipe the dough would simply spread out and I'd end up with a flat loaf. 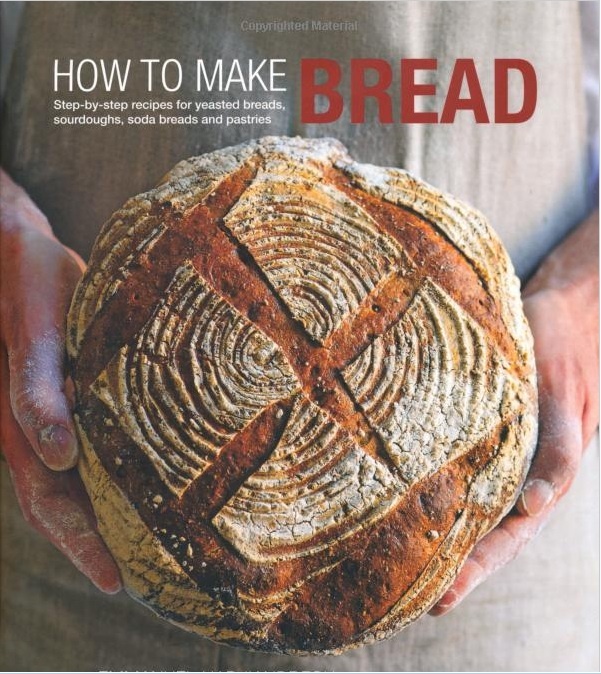 I have a bread book by Jan Hedh and his scalded bread recipe also instructs to shape the dough into a square, A video of this shaping process and images of the dough during proofing would really help as I'm struggling to visualise the process. Tried out your recipes in 'All You Knead is Bread'. (basic white loaf and semmel rolls).The crust of the bread I managed to bake was crunchy and a bit hard when it came out of the oven. However it became hard and rubbery when cooled (and this had been a problem I find even with other recipes). The inside of the bread tasted fantastic though. I am not sure if I did anything wrong or if there is any ways to improve the crust texture as my kids find it hard to chew! 1. Is the oven hot enough? Basically the faster bread bakes (ie the hotter the oven) the thinner the crust will be. I know I say 200 degrees for 45 minutes but if you can get it up to 230 or 230 and bring the cooking time down to 35 minutes or so, that should help. SOme ovens don't go about 200, hence the guideline of 200! 3. Your oven - some ovens (gas and convection) can really dry out bread as it bakes. Try spraying the loaf before you put it in the oven with water from a plant sprayer. This can help get a crispier crust! let me know! Hi, I attended one of your fantastic course with Lucie and have tried to make bread myself, my only problem is that my bread never really seems to double in size no matter where I put it too prove, even if I leave it longer than the time required. Any advice greatly received. Where do you live? In Europe you can get it at most supermarkets. In N America you can get it at some supermarkets and most healthfood stores. Let me know! Love your potato bread recipe - the dough gets a bit boisterous, but such lovely soft bread. Excellent. Will be using the recipe for hot cross buns for the texture. Tried your Graubrot recipe Saturday. What a disaster! I used the kilo of rye flour* and the 200g of wholemeal. The 700g of water (lukewarm) went in. The resulting dough was so heavy - it was like pastry. I had to cut the dough in half and knead each half, but it never really lightened. I left it for 2 hours and I can’t say that it doubled in size, so I left it longer. It eventually did, but by then it was too late to bake. I Ieft it covered in my kitchen and it still didn’t double in size (it was covered with a very large plastic bowl, so it didn’t dry out). No need for a proving basket – it clearly had no intention of changing shape! Baked it anyway to see what the result was. After 40 mins at 220, it was only cooked at the kissing crust. 20 mins more did no good and the middle was still raw, heavy and claggy. Now roughly 2/3 water to flour is okay for wheat flour, but I thought rye requires more. In any case, 700g is not 2/3 the weight of flour – I calculate that you need 792g water to make 2/3 of 1200g. Would I be right, or would it take a little more, given that we are dealing with rye? I thought I’d check with you before I go back to Waitrose so I can get more rye flour. Rye varies enormously in its ability to absorb water and it really moves SLOWLY in the cold. You mention 2/3 water to flour ratio in your last paragraph - that's fine for some bread but not for others. Remember there is so much variety. For a spanish style bread I use 1/4 water and for my focaccia I use a 1:1 ratio - there is no hard and fast rule. You say in your second para that it did double in size but it was then "too late to bake" and then in the third para that it did not double in size. Which did it do??!! It's hard to advise if I am not sure what was going on! Further, not sure what you mean by "cooked at the kissing crust". 1. try not to use instant yeast and if you do, it helps to proof it before you add it. 3. trust yourself. if you have to be "cutting" the dough - it is too dry. Add some more water. Rye bread can be almost like batter (try the Danish Rye recipe and you will see what I mean) but it can also be much dryer than that. If it is too wet it must be baked in a tin because you simply will never get it out of a basket! For the doubling, in size, it did both. At rising stage, it took 8 hours to double in size. When I shaped the 2 loaves, as best I could, and put them on the baking sheet, they were still more or less the same size the following morning. When it was rising, the heating was on and it was in the hallway - away from the cat-flap!.... but not next to the radiator, which I know would be a disaster. The loaves were shaped into roughly the same shape as the photo, but a bit thicker. When baked, the loaves (which were barely 1cm apart), touched, forming a kissing crust where, when they were parted the bread that was between the two loaves, there was fluffy bread, but, as the loaves got thicker, the dough had not cooked. I'll have another crack at it with fresh yeast (which I can get) and let you know. Hi. Where do you find more "unusual" flours such as dark rye and kibbled/cracked rye in London? Whole Foods has the most variety but not these. And natural food store had less options and not these. Thanks for any specific ideas. Hello! the best thing to do is order direct from a stone miller. Mine is Cann Mills (Stoates) http://www.stoatesflour.co.uk/ and if you call or e mail he will send you dark and light rye (organic and non) as well as whatever cracked (kibbled) grain you want! An update on the Graubrot. Upped the water to 792g and it was a steaming success. Dough was mildly sticky, but after rising, it was nice and firm, held its shape beautifully while proving. As I used a dark rye, it was a lovely dark brown, like gingerbread. And it rocks if you put walnuts in it. Claudia - dark rye is available from Waitrose. And some of the larger Tescos do it too, but it's usually hidden in the "Free From" section as they consider it an alternative to wheat for the gluten intolerant, rather than a mainstream grain for bread. Recipe required for a bread starter could you please advise. Dear Mrs Heaton - not quite sure what you mean by "a bread starter". Do tell me more and will be happy to help! Love your book "All you Knead is Bread". Does anyone know if there is a REAL BREAD campaign (like the one in UK) here in Canada? Hello! I am so pleased you like the book!!! thank you. There is not a Real Bread Campaign in Canada but if you contact them maybe they can give you tips on how to start one! Hi - I am enjoying the Book of Buns, but I have two questions about how you treat recipes with milk. First, why is it necessary to scald the milk? No other modern bread recipes do that. Second, why do you specify to leave the milk and yeast mixture to sit for an hour after the milk is cooled and before proceeding with the recipe? I understand autolyze, but this isn't that because the flour etc isn't mixed with the yeast/liquid. Thanks. Thanks - would it work if I scalded milk beforehand and kept it in the refrigerator for a while, then took it out? Also, I use a brand of yeast (SAF Gold) that claims it is "specifically formulated for use in sweet doughs". Don't know if it is available outside the US, but it does seem to do better than regular instant yeast with sweet dough. And you're sooo right about there being a zillion ways to make bread. I've developed my habits and preferences over the years, and often translate a new recipe into my usual habits. But I try it as written first to see if the specified technique makes a difference. Hi there, yes indeed that works! I did that for the entire photography shoot because I had to have SO MUCH that I just did it all in advance. I think you will find that SAF gold has a lot of "flour improvers" in it that makes it more powerful and work more quickly. They make me a bit nervous as, with a bit of patience you can get the same or better results without them. Hi Jane, How much white flour starter should be used to make the pre-dough for virtuous bread. The recipe says weigh 90 gms and return to refrigerator but with refreshing etc the mass of starter remaining will vary. Is there an estimation of how much starter to use in relation to the amount of flour in the pre-dough or for that matter in the whole recipe. Rob. If your starter is brand new (ie 5 days old because you just made it) you take 170 g out of the bowl and that IS your "refreshed starter" so you use that to make your predough by adding 300 g flour and 200 g water. The reason is that after 5 days of making your starter you have plenty and it's fresh and bubbly so you can use it straight away and there is enough to save for next time you bake. If it's from a starter that you made earlier (mine is from 1857) the point is always that you don't want to run out so you make more than you need. You need 170 g so you can take 55 grams (or so) of starter from the fridge and mix it with the same amounts of flour and water to refresh exactly what you need and use that to make your pre dough. OR (the point being you never run out) you simply take out more (90 g is a nice number) and refresh that whole amount, using 170 g the next day and keeping back 100. Why 90 and 100? Because if you keep back 100 g you will only ever get about 90 from the jar. About 10 g always stays behind on the sides and bottom! I hope this helps. Please let me know if it is not clear. Hi Cate, Excellent answer, thanks a lot. Rob. All of the books listed are on Amazon! I have just acquired a copy of The Larousse Book of Bread and the recipe's call for "all purpose (plain) flour. I'm not sure if that just means plain flour or does it mean 'strong plain flour' Anyone out there know? thanks for this. All purpose flour is slightly higher protein content than plain and slightly less than bread! It's one of those things like washer dryers or sofa beds - (don't wash or dry as well as separate units, are not as comfy to sleep on or sit on as a bed or a sofa...) It's developed so that Susy Housewife only needs one bag of flour our her shelf but I don't think it works as well for cakes as plain flour, nor as well for bread as bread (or strong) flour. So...to replicate all purpose outside of N America (the only place you can buy it) you can either use 1/2 plain and 1/2 bread (or strong) flour or, if you are making cakes or sweet bread / buns you can use plain flour and if you are baking bread you can use strong flour. I hope I have not confused you! I recently caught bread fever and started my journey down the road to crusty perfection and gorgeous, envy-inducing crumb. I've tried to make a couple sourdough loaves using my own homemade starter. I checked before using and my stater passed the "floating test." My loaves come out tasty, with some nice crumb but they don't rise the way they're supposed to. Do I need to re-do my starter? Let the dough sit and rise longer? Thanks ahead of time for any light you might be able to shed on what I'm sure is a common problem for bread-making newbies.